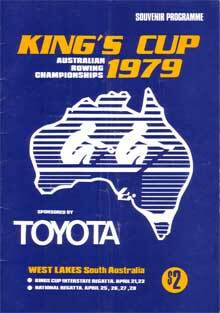 The King's Cup race returned to being a first and final after many years of heats and repechages. The Victorians took the early lead and led all the way. By the 500 metre mark they had a clear lead. SA and NSW had a good battle for second place. Challenges were a plenty in the second half of the race from SA and NSW for the lead. Victoria held on to win by 1.8 seconds in a good race. Up to 3 scullers per State were allowed and most States took advantage of this provision. It was an all the way win for Hale. Up to three crews per State were allowed to race this year. The two Victorian crews battled each other hard throughout the race with the no 2 crew winning by 2.3 seconds and only 0.5 seconds back to NSW No 3. The winning crew contained Andrew Michelmore who had returned from his Rhodes scholarship at Oxford. He had stroked two Oxford crews to victory in the Boat Race in England. NSW led all the way and won by a length. This was a first and final won comfortably by VIC by the large margin of 14.9 seconds. Details of the heats and repechage have not yet been located. The final was an all the way win to Mary Renouf of Victoria by 5.1 seconds to fellow Victorian Rosemary Hoffman. This was also a comfortable win to Victoria by some 15 seconds.